For any questions or enquiries, don't hesitate to contact our Customer service . 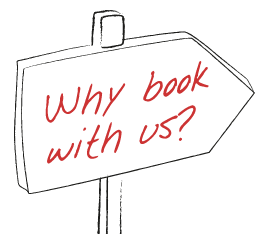 To check the status of your booking or to change it, log on to our website. "Your website is very useful, I went on holidays to Amalfi with my wife and I used your transfer service, which was very good and convenient. The vehicles were all clean, comfortable and in excellent conditions. The service was punctual and reliable. Thank you very much." "I have booked a transfer in Sorrento for my parents with your company and it was very good! Your drivers are very nice and ready to satisfy all needs. I organized with your company transfers to Naples, Sorrento, Pompei and Rome. I suggest your services to everyone!"